Tommeke Boonen says he's focused on the first week of this year's Tour, which will be key to defending his victory in the Tour's green jersey competition. “If I can collect enough points then there will be a good chance,” Boonen told VeloNews. Boonen, who Sunday won a 2nd Paris-Roubaix, hopes to build to a third peak later in the season, for the world championships at Varese in Italy this fall. It's the closest Tour de France final stage in history, with only 31 seconds between 1st and 3rd. 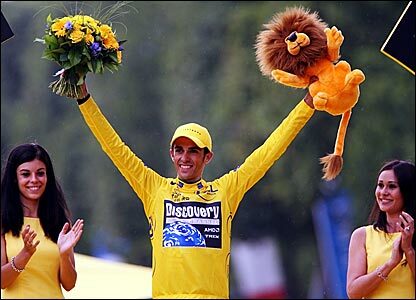 Discovery Channel's Alberto Contador is the golden boy, dressed in yellow and riding a yellow bike. Riding through the neutral zone, French national champion Christophe Moreau and the 4 jersey wearers (Contador, Tom Boonen in green, Mauricio Soler in polka-dots, and Amets Txurruka in white, where Contador and Soler lead the competition) go off the front of the field for pictures. Txurruka has also been named the most combative rider of the entire Tour. Sherwen has wrapped up the VS. competition. We'll see whether Cadel Evans wants to contest today's stage. Levi Leipheimer won't attack his own teammate, and it's hard to see any way for him to make time on Evans without threatening Contador. CyclingNews.com yesterday reported on the possibility of a “spectacular” rider demonstration during the stage. We've got two 4th Category climbs before the first intermediate sprints, where those all important bonus seconds are on offer. Gert Steegmans has launched a campaign to win the King of the Mountains jersey. Unfortunately, it looks as if Tom Boonen's big leadout man may have waited a bit too long. And that does it for the KoM competition for the year. Just two intermediate sprints and the finish on the Champs-Elysees are left. So, will he or won't he? The big question as the race approaches the Châtenay-Malabry intermediate sprint is whether Cadel Evans will be hunting for bonus seconds on the course. Discovery Channel puts 3 men at the front of the field, and Evans moves up near the front, while Quick Step, protecting the green jersey of Tom Boonen, has 4 men up front. With a kilometer to the line, Quick Step's Carlos Barredo and Steven de Jongh ride off the front of the field to take the points (and therefore the bonus seconds) off the board. Française des Jeux's Lilian Jegou tries to bridge up, and as the line nears, he comes around the Quick Steps, who don't contest the sprint. Evans stays in the field. Looks like he's content with 2nd. Coming onto the Champs-Elysees, Discovery Channel moves to the front, and it's George Hincapie, who may switch teams in the off-season, who leads the field onto the finishing laps, ahead of the 8 surviving Discovery Channel riders. Agritubel's Freddy Bichot launches the first real attack of the stage, quickly matched by Chris Horner. They're pulled back. A big group gets away with 40 kilometers to ride. It's Caisse d'Epargne's José Ivan Gutierrez and Nicolas Portal, Rabobank's Juan Antonio Flecha, Milram's Christian Knees, AG2R's Simon Gerrans, Lampre's Alessandro Ballan, Liquigas' Maurilo Fischer, Credit Agricole's Anthony Charteau, Gerolsteiner's Ronny Scholz, and Française des Jeux's Mickael Delage. 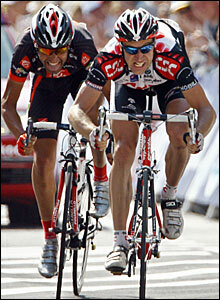 Flecha's a former stage winner, and Fischer a sprint specialist. Their gap quickly grows to around 30 seconds, and they take the points at the 2nd intermediate sprint. Barloworld, looking to set up Robbie Hunter for a 2nd sprint stage win, moves to the front to bring the 10 men back, but to little effect, and with 3 laps to ride, the gap was out to :45. Finally, Credit Agricole joined in the chase, and the lead started to fall. With 15 kms to ride, the gap was 30 seconds. With 9 kms/5.5 miles to ride, it was 18 seconds. With 7.5 kilometers to ride, Gutierrez attacked from the leaders group, matched by Flecha, avoiding the recapture of the 8 surviving members of the escape group, but they were quickly overtaken, and the field rode as one with 5.5 kilometers to the finish. Lampre moved to the front, trying to set up Daniele Bennati for the win, and all the sprinters' teams started to try to set up their lead-outs. As they came back up out of the tunnel and onto the finishing straight with 250 meters to go, Lampre had a man at the front, Quick Step had a lead-out behind him, Robbie Hunter was set up ahead of Tom Boonen, and here we go! Hunter swings way to his right, Bennati is the man behind the Quick Step leadout, and he's got an unimpeded line, going hard, there comes Zabel, Huter's going hard, here comes Hushovd, where's Boonen, and it's Bennati taking the stage! Bennati leads Hushovd then Zabel, Hunter and Boonen to take his 2nd stage win of the 2007 Tour. Back in the field, there are no time gaps, no miracle attacks by Cadel Evans, and Discovery Channel's Alberto Contador has nailed down the overall victory in the Tour de France at 24! The day's breakaway, Boonen and Steegmans at the line, and Vaitkus struggles to the finish, by Graham Watson, from his Stage 2 gallery. Fred Rodriguez and Tom Boonen, by Sirotti, from CyclingNews.com's Stage 2 Gallery. The Eneco Tour of Benelux came to world road champion Tom Boonen's hometown of Balen today, and the Belgian supersprinter delivered for the local fans. Thunderstorms and greasy conditions played havoc with the Cycling.TV live coverage, but they were able to show the finish seconds after Boonen outkicked Credit Agricole's Julian Dean and Milram's Simone Cadamuro. It was Boonen's 3rd sprint win of the race, and 20th of the season. He's got to be looking forward to the upcoming world championships, where he'll be a strong favorite to repeat. 3) Simone Cadamuro, Italy, Milram, s.t. 4) Alexei Markov, Russia, Caisse d'Epargne, s.t. 5) Alessandro Ballan, Italy, Lampre, s.t. 6) Yuriy Krivtsov, Ukraine, AG2R, s.t. 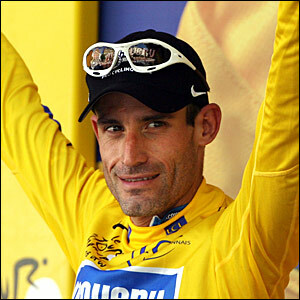 7) Enrico Gasparotto, Italy, Liquigas, s.t. 8) David Kopp, Germany, Gerolsteiner, s.t. 9) Olaf Pollack, Germany, T-Mobile, s.t. 10) Lloyd Mondory, France, AG2R, s.t. The stage had minimal effect on the overall classification, where George Hincapie continues to lead Gerolsteiner's Stefan Schumacher by 3 slim seconds. Discovery Channel's George Hincapie broke his string of 2nd-place time trial finishes with a big win in Landgraaf. Over a short but technical 16.1-kilometer course, Hincapie was .21 seconds faster than 21-year-old Vincenzo Nibali of Liquigas, and almost 7 seconds faster than Gerolsteiner's Stefan Schumacher. Hincapie takes over the Tour of Benelux lead from world champion Tom Boonen, who won the Tour's 1st and 3rd stages but finished 63rd on Sunday, 1:27 behind Hincapie. Schumacher moves into 2nd, at :03, and Nibali sits 3rd at :11. World Champion Tom Boonen took the 1st stage at the Eneco Tour of Benelux today, outkicking Milram's Simone Cadamuro and Enrico Gaspartotto of Luquigas at the finish in Hoogeveen in the Netherlands. With a time bonus, Boonen takes over the red race leader's jersey from prologue winner Stefan Schumacher of Gerolsteiner. 3) Enrico Gasparotto, Italy, Liquigas, s.t. 4) Julian Dean, New Zealand, Credit Agricole, s.t. 6) Alexei Markov, Russia, Caisse d'Epargne, s.t. 7) Fabio Sabatini, Italy, Team Milram, s.t. 8) Stefan Schumacher, Gerolsteiner, s.t. 9) Alessandro Ballan, Italy, Lampre, s.t. Thor Hushovd suffered an ugly gash on his upper right arm near the finish line of today's stage. He came to a stop just after the finish, and sat down against the barricades, where he proceeded to bleed all over his leg and jersey (and that should bring in some of those American fans!) as an onlooker pressed on his arm to stop the flow of blood. Apparently, Hushovd was cut by a promotional hand brandished by a spectator as he went full-bore to the line. After a brief hospital visit, and four stitches, Hushovd is expected back on the start line tomorrow morning. World champ Tom Boonen said his deceleration late in the sprint wasn't because he was beaten, but because he was hit by a fan's camera, as he followed Hushovd's lead, sprinting a hair's-breadth off the right-hand barricades. Tour organizers will prohibit PMU, sponsors of the green jersey contest, from distributing the hands in the last 2 kilometers of sprint stages, which is pretty much their only point. There's a doomed break of 7 quality riders with about 20 miles to ride: Stephane Auge of Cofidis, Walter Beneteau and Matthieu Sprick of Bouyges Telecom, Unai Etxebarria of Euskaltel-Euskadi, Nicolas Portal of Caisse d'Epargne, Benoit Vaugrenard of Française des Jeux, and Fabian Wegmann of Gerolsteiner. They had 4:30 in hand for a long time, bu the gap is now only about 90 seconds. Wegmann took the first King of the Mountains points, over a 4th Category climb, so he'll be the first rider in polka-dots. Tom Boonen told the Tour website he thinks he'll take the yellow jersey off Thor Hushovd today, and wear it into Belgium. There's a 20-second time bonus for the win, 12 seconds for 2nd and 8 seconds for 3rd, and Boonen finished just 11 seconds behind Hushovd in yesterday's Prologue: "If I’m first and Thor is third, then it’s enough for me to get the lead and I think I have the speed to beat him..."
Boonen told Jason Sumner of VeloNews he thinks Hushovd's performance yesterday gives Boonen a better chance today, since the training Hushovd has focused on endurance and time-trialling is likely to hurt his sprinting. With 21 kilometers, about 12.5 miles to ride, the team cars are getting pulled, and the gap to the 7 breakaway riders is down around 45 seconds. At 10 miles to ride, the break is splitting. Beneteau has attacked off the front, he'll be the last one caught. Portal and another rider are trying to get back up with Beneteau, while the other 4 are sitting up, waiting to be caught. Portal and Wegmann have given up, so only Beneteau is out there. The peloton slowed down on the capture, so he's out to 35 seconds, but he's got long, long odds. Beneteau took the final intermediate sprint points and a 6 second time bonus. As the peloton approached the line, George Hincapie threw down, sprinting out of the field for the bonus time. One of Hushovd's Credit Agricole teammates countered, and passed Hincapie for the 2nd-place and 4 seconds bonus, but Hincapie took 2 seconds and became the loneliest man in the race, “the Yellow Jersey on the road.” It's going to be an interesting race for the GC. Beneteau is caught and we're down into the last 3 miles to ride. Danilo Di Luca has gone off the back. Apparently, he's on antibiotics, but he's going to lose a couple of minutes at least today. Rabobank goes, then falls back. Liquigas has a few riders together on the right of the field. Less than 2 kilometers to ride. Hincapie is in the top 15, Hushovd is in the front 10. One of the Liquigas riders pulls off, Backstedt is 8 riders back. Zabel, Freire, Hushovd near the front with a k to ride. Hushovd is in 2nd wheel, with McEwen right on his wheel. Zabel right behind McEwen. Now the chaos comes, Boonen may have gone early, shadowed by McEwen, Jimmy Casper drops Boonen, Zabel is right there. Hushovd is bleeding heavily from his right arm. He's sitting against the barricades after the stage finish. Looks like Jimmy Casper of Cofidis for the stage win, but it's very close. Niko Eeckhout of Chocolade Jacques is the new Belgian national champion, after a last-kilometer attack that brought him home ahead of Française des Jeux's Philippe Gilbert and world champion Tom Boonen, the race favorite. Discovery Channel's Leif Hoste, already signed to Davitamon-Lotto for next year, was 4th on the day. The Belgian TT championship is in August. QuickStep is looking to put reigning world champion Tom Boonen in green at Tour's end. They've got 2006 Milan-San Remo winner Filippo Pozzato, 2006 Giro Stage 19 winner Juan Mañuel Garate, and QuickStep's latest addition, José Rujano. Venezuela's Rujano owned the mountains at last year's Giro, but dropped out of this year's Giro early, just before his bizarre contract expired with Selle Italia, and his contract with QuickStep started. Rujano has since apologized for his season thus far, and for withdrawing from the Giro when he did (see Rujano says thanks and goodbye to Selle Italia, from CyclingNews.com). Paolo Bettini will not race the Tour, likely looking toward September's World Championship in Salzburg. QuickStep's reigning Olympic champion, Paolo Bettini, will stay with the team for another two years. QuickStep's manager Patrick Lefevere had fueled speculation that Bettini would jump ship to T-Mobile when he said the team couldn't afford the salaries of its three superstars: Bettini, reigning world champion Tom Boonen, and Milan-San Remo winner Filippo Pozzato. Eurosport reports Bettini walked away from a 2 million euro proposal from T-Mobile to re-sign with QuickStep, and that the signing is likely to leave Pozzato looking for a new squad next year. 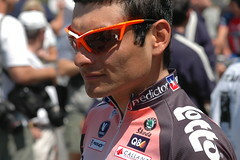 He's been linked to Cofidis, and has said he would like to take teammate Guido Trenti with him. CSC's Fabian Cancellara took his biggest win since the 2004 Tour prologue, escaping with classics specialist Peter Van Petegem and losing him on the Carrefour de l'Arbre. Cancellara was aided by a train, whose inopportune timing led to Petegem and Discovery Channel's Leif Hoste and Vladimir Gusev being disqualified for going around the crossing barricades. Boonen and the rest of the field were held up for 15 seconds or so, and after that, with 10 kilometers to ride, Cancellara was home free. The judges' decision has unleashed a firestorm, since Boonen's group also went around the barricades, but after rather than before the train came through. CyclingNews.com offers UCI President Pat McQuaid's take on the ruling, and notes that Petegem's Davitamon-Lotto team has lodged a formal protest (in 3 languages). Discovery Channel's George Hincapie, who has long named a Paris-Roubaix victory as one of his goals, crashed out with a broken steerer tube. Hincapie was riding a custom Trek, featuring an elastomer suspension and other features to minimize the vibration and pounding of the most rugged of the classics. Hincapie went down hard on his right shoulder, and reports on Monday say Hincapie will have surgery and miss 15 days of racing. Hincapie's prototype featured an aluminum steerer bonded to an OCLV fork, which Trek will reportedly be examining closely. That puts him out of next week's Tour de Georgia. ThePaceline.com has photos of Hincapie with wife and daughter in his cast and sling at the Atlanta Airport Monday. Hincapie undoubtedly in the best form of his career in an opportune situation with two of his team in the break was given the worst decision of the fates on this Sunday in Hell. Tom Boonen, the prohibitive favorite to repeat last year's victory, was isolated from the Quick.Step team that has controlled the spring classics calendar. CSC, Team Discovery, and some opportunists kept the pace at full hammer all day. The disqualifications left Boonen in 2nd, and meant he'll wear the hybrid World Champion/ProTour leader's jersey for a while longer. Milram's Alessandro Petacchi says he's (duh!) the team's leader for Milan-San Remo tomorrow, and that he's glad to have Quick Step's Tom Boonen as the favorite in the season's first classic. "It's no secret that Boonen wants to start the classics season with a win at Sanremo. This time, he is obligated to step up to the plate. Him and his [Quick Step] team, of course." Boonen has said that though he does not like the race, his intention is to win the first, and longest, classic of the season. "Last year, nobody talked about [Boonen] before the race and all the pressure was on me," Petacchi said. "This year the roles are reversed, and that doesn't bother me." PezCycling News details the tactical considerations throughout the course, and notes that Boonen and Petacchi are even with oddsmakers at 4-1, with Thor Hushovd 9-1. VeloNews reminds us that this race isn't always a sprinters' showdown. 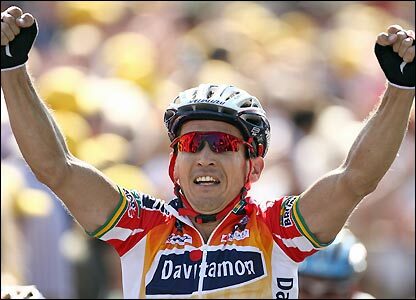 This year, I think it is, but I suppose we could see a repeat of 2003, with all those sprinter teams waiting for each other to put in an effort to chase down a quality break. I don't think we will, John Wilcockson doesn't think we will, and I'm sure neither Petacchi nor Boonen thinks we will. Wilcockson mentions again that organizers intend to add the Pompeiana to the route (PezCycling offers a report on the climb), between the Cipressa and Poggio, in an effort to eliminate an annual sprint finish. Cycling4All has the final start list. The World's Fastest Mennonite has done it again, adding the Paris-Nice title to his freshly won overall at the Tour of California. Markus Zberg took the final stage, fighting back to Evgeni Petrov and Alberto Contador after getting dropped, then beating both to the line. "It was a difficult race to win because there were no mountaintop finishes and there were no long time trials," Landis said. "In some ways I was lucky. I had a good day on a very difficult stage. At the Tour, you don't get lucky and win. You have to be good every day for three weeks." The next races on Landis' calendar are the Criterium International, the Tour de Georgia, and the Giro d'Italia. Patxi Vila was 2nd overall, and Antonio Colom, who soloed away from the field late Sunday to move up the leaderboard, took 3rd overall. Bobby Julich didn't start Sunday's last stage, after crashing on Saturday. Tom Boonen is looking ahead to Milan-San Remo this weekend, and decided a day with 4 categorized climbs might take a little too much out of his legs. Update: USA Today named Landis its U.S. Olympic Athlete of the Week for the win.